Energy drinks are supposed to do just what the name implies — give you an extra burst of energy. As it turns out, most of that “energy” comes from two main ingredients: sugar and caffeine. A typical energy drink can contain up to 80 milligrams of caffeine (about the same amount as a cup of coffee). By comparison, a 2006 study found that the average 12-ounce soda contains 18 to 48 mg of caffeine. 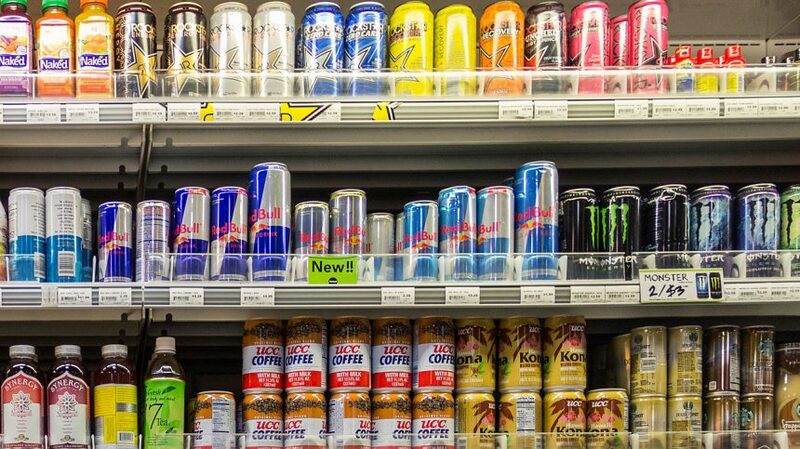 Other than caffeine levels, how do energy drinks differ from sodas and sports drinks? Soft drinks are mainly water, sugar and flavouring. They don’t do anything for your body; they’re just supposed to taste good. Sports drinks are designed to replenish fluids lost during activity. They typically contain water, electrolytes and sugar. Energy drinks have added caffeine and other ingredients that their manufacturers say increase stamina and “boost” performance. They’re designed for students, athletes and anyone else who wants an extra energy kick. Energy drinks became popular in Asia long before they reached the United States. In 1962, Japanese pharmaceutical company, Taisho, released its Lipovitan D drink. It was designed to help employees work hard well into the night. Lipovitan D contains taurine, the same ingredient found in many of today’s energy drinks. The very first “energy” drink to reach the United States wasn’t really an energy drink at all — it was more of a hyped-up soft drink called Jolt Cola. The “jolt” in the cola was a lot of added sugar and caffeine. Introduced in the 1980s, Jolt Cola quickly became a staple of college campuses. Taurine – A natural amino acid produced by the body that helps regulate heart beat and muscle contractions. Many health experts aren’t sure what effect it has as a drink additive (and the rumor that taurine comes from bull testicles is false). B Vitamins- A group of vitamins that can convert sugar to energy and improve muscle tone. Carnitine – An amino acid that plays a role in fatty acid metabolism. Looking at the ingredients, energy drinks appear to be part soft drink and part nutritional supplement. According to reviewers, the taste falls within the same range. People who have tried energy drinks have described the taste as ranging from “medicinal” to “molten Sweet Tart.” Although the manufacturers claim that energy drinks can improve your endurance and performance, many health experts disagree. Any boost you get from drinking them, they say, is solely from the sugar and caffeine. Caffeine works by blocking the effects of adenosine, a brain chemical involved in sleep. When caffeine blocks adenosine, it causes neurons in the brain to fire. Thinking the body is in an emergency, the pituitary gland initiates the body’s “fight or flight” response by releasing adrenaline. This hormone makes the heart beat faster and the eyes dilate. It also causes the liver to release extra sugar into the bloodstream for energy. Caffeine affects the levels of dopamine, a chemical in the brain’s pleasure center. All of these physical responses make you feel as though you have more energy. Energy drinks are generally safe, but like most things, you should drink them in moderation. Because caffeine is a stimulant — consuming a lot of it can lead to heart palpitations, anxiety and insomnia — it also can make you feel jittery and irritable. Over time, caffeine can become addictive. It is also a diuretic — it causes the kidneys to remove extra fluid into the urine.